We were thrilled to be a part of the Atlanta Homes & Lifestyles Designer Showhouse, right here in our own neighborhood of Serenbe. A fabric tape balanced this bold wallpaper to a comfortable, preppy glamour. Custom abaca rug by Mary McDonald from Patterson Flynn Martin. All Photos by J Ashley Photography. Set on a European-inspired square in Serenbe’s newest neighborhood, the showhouse featured the amazing work of 12 Atlanta designers. Each individual space had its own designer. We had the privilege of styling the downstairs hall and powder room – areas of the home that are often forgotten or under-designed. Not this time. 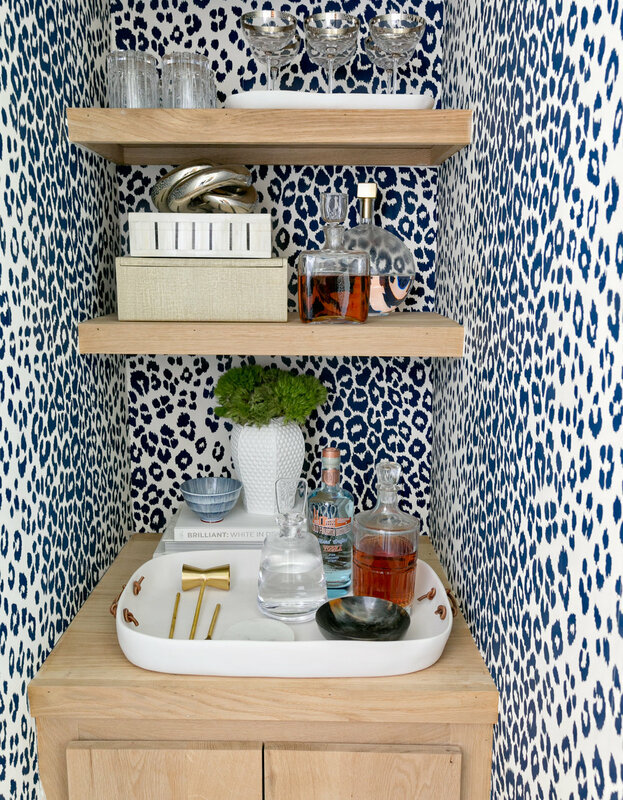 The wallpaper is Schumacher Iconic Leopard and the art is by San Francisco artist Chloe Meyer. For us, it was all about making a big impact in a small space. 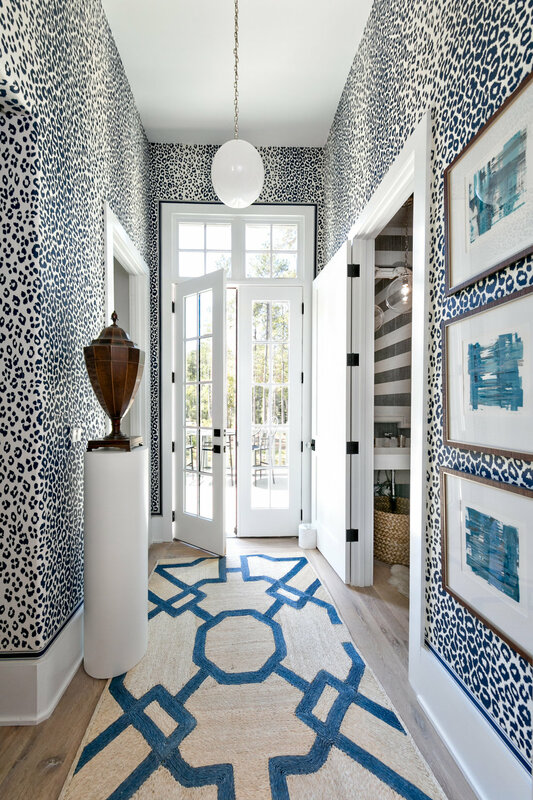 We used bold pattern, texture and accessories to make a statement from the front door. We added an antique knife holder from William Word Antiques atop a simple white pedestal as the centerpiece of the space. Open shelving was used as a beverage station. We decked it out with home accessories from Bungalow Classic and barware from Dixon Rye. In the powder we added a Miles Redd for Ballard Designs mirror and an Eames walnut stool. This handsome fellow made a big impact and reflected the nature just steps away. Check out this video to see the before-and-after details.